Innovega is working on display technology using contact lenses that enhance human vision to directly see near-to-eye objects like electronic micro-displays. This technology can be used to make see-through augmented reality displays using transparent OLED and LCD displays. The technology behind the iOptikTM contact lenses involves sophisticated optics and filters embedded into standard contact lenses. These special contact lenses enable your eyes to focus on micro-displays placed very, very close to your eye. 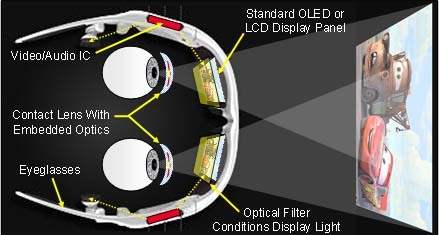 The optics in the contact lens magnify the micro-display's tiny image and make it look very large. The light that is coming from the surrounding environment is not magnified and is seen as you would normally. The trick is in separating out the display's light from the surrounding's light. That is where the filters come into play. The iOptikTM contact lenses allow your eyes to clearly see the micro-display panels even though they are very close to your eyes. Because the images are so close, they appear to be very large, much like a movie theater screen. Because the image seen by the left eye can be different than the image seen by the right eye, 3-D images can be viewed just like at the movies. The image generated by the micro-display is very small. In fact, the micro-display itself is very small. This is what allows it to fit so compactly into standard sunglasses. "Scleral lenses?" she asked. "You've got DreamTime technology in contact lenses? That's not available to the public!" Via Innovega; thanks to Ioachim Ciobanu of fatcat for the tip on this story. See also Circuit Smart Contact Lens, Presaged By Niven, Barnes and Vinge for comments by Vernor Vinge on these technologies.